Compared to fillings which just cover a small portion of a tooth, a crown (or cap) encases the entire visible portion of a tooth and is recommended with more than half of the tooth is affected. In effect, the crown replaces the enamel and acts as the tooth's new outer surface. A dental crown can be recommended when a tooth is broken or decayed to such an extent that fillings are not able to repair the problem or restore the tooth back to proper form and function. 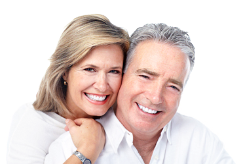 Nowadays, crowns can be offered in a variety of materials that fit the needs and esthetics. Gold, porcelain to metal combination, all porcelain crowns may be recommended by your dentist to fit the specific needs of the tooth and the priorities of the patient. Crowns can last 20+ years with good hygiene and maintenance. It is important to attend regular check ups and cleanings so that the crowns can be monitored and maintained. The first visit to your dentist involves taking the shade to match the surrounding then numbing the tooth. The dentist will remove any decay and then the outer shell is removed. After the tooth has been reshaped, a mold (impression) of the tooth is taken so that a lab can create a custom crown. A “build up” is used to replace any structure lost from the cavity or crack that is crucial to retaining the crown. Before leaving the office, a temporary crown made out of tooth colored acrylic will be cemented on by the assistant. Keep in mind, this is just a temporary and is not meant to feel or fit as closely as the permanent crown. On the other hand, It is important to maintain your temporary in order to protect the tooth and prevent shifting of other teeth. If the temporary is broken or lost, the final crown may not fit well and will have to be remade. Call True Dental right away to have a temporary replaced or repaired. The finally crown typically comes back in two weeks. At that appointment you may or may not be numb, depending on how sensitive you are before removing the temporary. The final crown is tried in and checked for color match and fit visually and on the X-Ray. If it is acceptable, the crown will be permanently cemented.